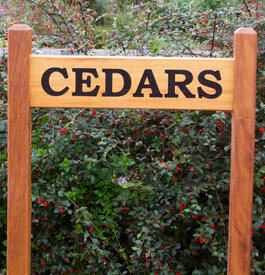 Wooden Signs Overview - Wooden Sign Images - Gallery Menu- Oak House Signs - House Numbers - Carved Rustic House Signs -Elegant RangeDouglas Fir - Sapele - Cedar -Posts & Brackets - Large Signage - Which Timber? 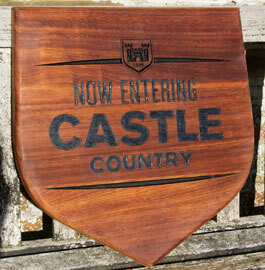 -Round and Oval Wooden Plaques. Iroko is similar to teak in appearance and is imported from West Africa. It has a colour which can vary but for signs it is usually a pale golden brown, although it can darken to a richer brown over time. It has a medium to coarse texture with an interlocking grain that often produces interesting patterns. 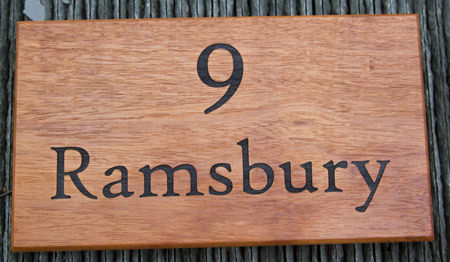 It is an extremely dense and stable timber which is naturally oily and therefore highly durable and ideal for external signs. 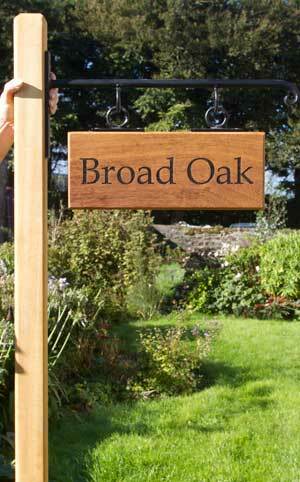 It is low maintenance and unlike oak it can be left untreated. If you want to keep it looking as new, then wipe over with Danish Oil every couple of months. It is used widely for boat building, window frames as well as cabinet work and furniture making. 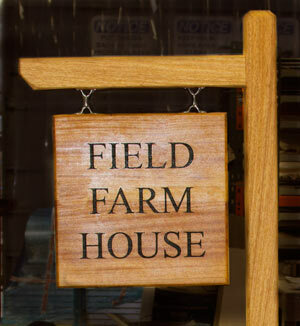 The lettering is carved into the sign by sand blasting, lasering or with a CNC router depending on the size of the sign and detail required. The letters are then painted Black or Brown as standard. Red, White, Farrow & Ball Stiffkey Blue, Farrow & Ball Purbeck Stone (light grey)or Heritage Green are also available at £5. We have most of the common fonts - for a selection CLICK HERE For some other fonts and ideas have a look at the Gallery page. The Standard Sizes (Styles IJ-IO) are on 4" 100mm high iroko and 6" 150mm high iroko in all UPPER CASE or Upper and Lower Case. On the 6" iroko there is the choice of one or two lines. On the Standard Sizes the length depends on the number of letters. The alternative method is 'Made to Measure'. Here you choose the size of the timber . The wording can be laid out any way you choose.